Coral stitch a very pretty and effective stitch. 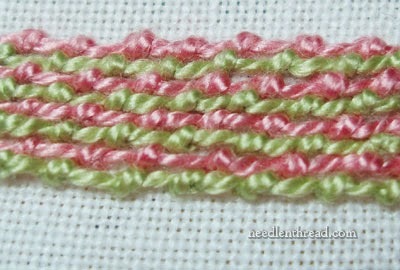 The stitch of the week is Coral Stitch brought to you once again by the lovely Mary Corbet. You can not believe that she basically taught herself to embroider can you? It gives us all new hope! 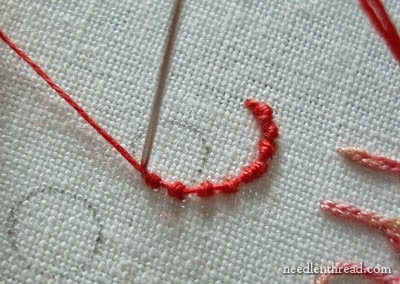 This is a very pretty stitch and is a simple but effective border stitch. You could use on anything you wanted to make such as a cushion cover, a little girls skirt or to frame a piece of work that you have stitched. In addition to a pretty pattern you can do lettering with this stitch and here is a picture to show you what Mary Corbet has done as an example. So make a warm drink and settle down and watch this tutorial.